It is really an original gift. Everyone appreciates the Mother House’s preparation of this gift, these plaques with pictures of saints who are particularly meaningful to our Community. On the back of every plaque is a prayer that will be prayed daily in each house at the end of a specific time of Community prayer. On her birthday Mother Elvira randomly drew a Saint for e ach house, who is now the patron and the true friend of that house for the year. poor… and they persevered to the end! 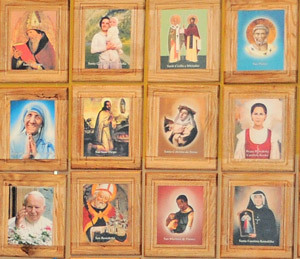 You can meet the “patron” saint of the houses and download the prayer that the girls and boys are praying, both in Italy and in the many countries across the world. If you wish, please click on the links below and pray the prayers with and for us!